Jordan Waeles has one dream... to mix live, for an audience of 20.000 people! 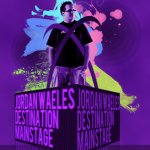 Destination Mainstage is a monthly show on Afterhours.FM, where Jordan Waeles takes control of the air semi-live with his keyboards and turntables, and delivers blood-pumping, live-style mixes. Some sets include tons of effects, some include classics, but all sets are pure trance choonage! Listen to the monthly demo reel of Jordan every first tuesday of the month, 16.00 CET of Afterhours.FM, leading trance radio!